SAN SALVADOR (Reuters) - Expelled from the ruling leftist Farabundo Marti National Liberation Front (FMLN) and thwarted in trying to create his own party, Nayib Bukele forged his own path to victory as an outsider in El Salvador's presidential election. 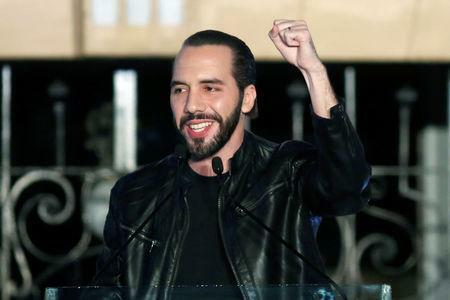 Bukele, 37, a businessman and former mayor, had to search for a new political home after being ejected in 2017 from the FMLN for a allegedly breaking party rules. 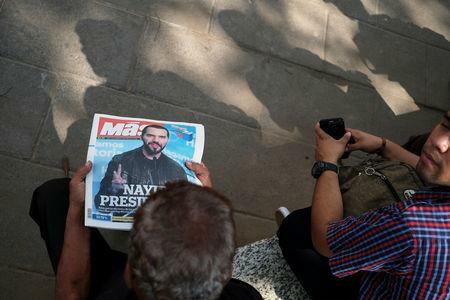 In his last days as mayor of the capital, San Salvador, last year, Bukele tried and failed to create his own party. He then joined a center-left party, only to see it shut down by El Salvador's electoral tribune. Finally, he aligned himself with the Great National Alliance (GANA), a conservative party. Bukele, an entrepreneur of Palestinian descent, is a self-professed fan of U.S. television series such as the political thriller "House of Cards" and legal drama "Billions." He and his wife, ballerina Gabriela Rodriguez, just finished watching "The Good Wife," a U.S. series that aired from 2009 to 2016 about the wife of a disgraced politician, Bukele told local media. Bukele, who did not respond to requests for comment, made his political debut in 2012 as mayor of Nuevo Cuscatlán, a small coffee-growing town outside the capital. With limited resources and little media attention, he used social media to draw attention to his work. He has been accused of plagiarizing parts of his government platform. He is also under investigation for alleged money laundering and fraud during his time as mayor of San Salvador and Nuevo Cuscatlán.